Fig. 11.5-1. Transverse section of ragweed stem (Ambrosia). This is a typical arrangement of tissues within a vascular bundle of a dicot or gymnosperm (technically, any plant with a eustele). The innermost part of the xylem contains the cells that differentiate first, while still small – this is the protoxylem. Protoxylem differentiates while surrounding cells are still elongating, so the protoxylem tracheary elements must use secondary wall patterns that can be stretched (annular and helical). 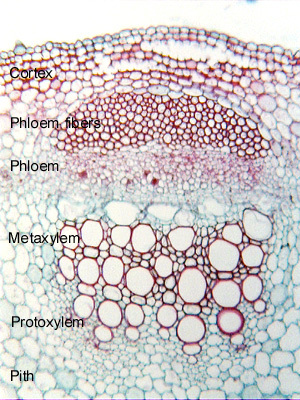 The xylem cells that differentiate later, when this portion of the stem is a bit older and the cells have had time to grow larger, are metaxylem; metaxylem does not mature until all surrounding parts of the internode have stopped elongating. Consequently, they can have any pattern of secondary wall, including the patterns that cannot be stretched (scalariform, reticulate and pitted; they can also have annular or helical patterns, but that is not common). Because the metaxylem is exterior to the protoxylem, the bundle is endarch – all seed plants have only endarch vascular bundles in their stems. Exterior to the xylem is phloem. All phloem visible here is metaphloem; the tiny bit of protophloem that had been present has collapsed to the point that it would be difficult to see at even the very highest power. This bundle has a large cap of primary phloem fibers. The word “primary” is important in this name; the secondary phloem can also have fibers, and it is important to distinguish the two. The word “primary” indicates that these phloem fibers have developed from cells that were produced by the shoot apical meristem; cells that differentiate into secondary phloem fibers are produced by the vascular cambium. Because the xylem and phloem run side by side, this is called a collateral bundle; collateral bundles are by far the most common type in seed plants. If there were phloem to the inside also, it would be bicollateral bundle; those are rather rare. There are many patterns that you could envision, and some do exist; the anatomy of vascular bundles has been very important in helping to figure out the evolution of land plants (especially the relationships between ferns and seed plants), and that is covered in Chapter 10 in Plant Anatomy (Mauseth) and also Chapters 23, 24 and 25 in Botany (Mauseth).